Attention units are the most valuable, precious assets people with ADHD have. Hearing this concept was like a moment of enlightment for me. Because I had never even heard the term attention units before. This was entirely new to me. 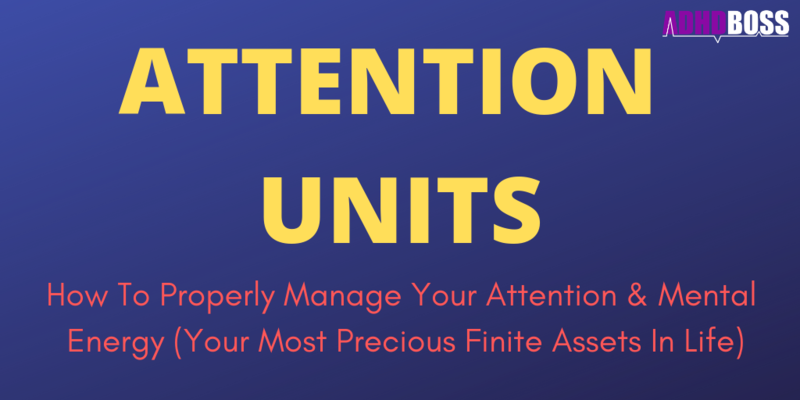 Here’s everything you need to know about attention units and why attention units are so unbelievably important for your mental clarity and livelihood. What are attention units exactly? You know that feeling you get when you know you’re supposed to be doing something important? It’s that nasty “burdensome” feeling that gets tucked away in the back of your subconscious mind. When you procrastinate or avoid tasks, you are allocating your attention units to “storing” the idea of that particular task, phone call, text message, email or any other obligation in your subconscious mind. This leads to less mental energy, greater frustration, unnecessary stress and a whole list of other potential problems. Why are attention units important? When managed carefully, attention units lead you to mental clarity. As you know by now, the more unfinished tasks and half-checked “to-do lists” you have laying around your home or office, the less mental clarity you will have. This is not a fun feeling. But the flip side of this is a truly empowering thing. When you’re able to finish tasks immediately, knock out to-do lists like a champion, and essentially take control of your ADHD, you will have so much more mental clarity to the point where you’ll feel like a new human being. ADHD medication helps a lot with freeing up your attention units. Once I started taking Vyvanse, I “magically” started taking care of unfinished business, knocking out to-do lists, and enjoying mental clarity at last. While ADHD medication is a controversial subject for non-ADHD’ers – the reality is ADHD medication drastically helps people with ADHD live a more productive life, with significantly higher mental clarity. Of course, ADHD medication is not perfect. And it’s not a complete solution either. Exercising, having healthy eating habits, enjoying a fun social life, and pursuing self-actualization are equally important aspects of freeing up your attention units. If you run a quick search on ADHD Boss, you’ll find that I’ve covered each of these topics many times over. A lot has changed in my personal life over the last few years. But the core mission behind ADHD Boss remains the same. ADHD Boss is here to help you live the absolute best and most fulfilling life possible with ADHD. Let’s imagine you’re already taking ADHD medication (or you’re fine without ADHD meds) – and you’re also taking care of your exercise, healthy eating habits and your social life. Here are some specific action steps you can take today to free up your attention units and enjoy greater mental clarity. Creating a master to-do list is one of the greatest feelings in the world. Well, once you’ve listed out everything in your life that needs to be accomplished or taken care of, you will experience an enormous feeling of relief. Yes, this easy step is going to free up plenty of your attention units. You’re removing unfinished tasks from your subconscious mind, and transferring those unfinished tasks onto a piece of paper or into digital note-taking software (I prefer Microsoft OneNote). I recently created a master to-do list for every single burdensome unfinished task I had tucked away into my subconscious. After creating my master to-do list, I felt absolutely incredible. You’re going to feel the same exact way. I promise. Your daily get-done lists are lists of 5 to 10 (or more) tasks that you will accomplish no matter what happens. There is no possibility of not accomplishing these tasks. You have to do them! Having this mindset will help you knock out a new daily get-done list every single day. I find that it helps to arrange your daily get-done lists in order of priority. For example, if you can create unique daily get-done lists for the next 7 days, and rank your lists from highest-priority to least-priority, you will be way ahead of the game. By this point, you should have a master to-do list, and you should also have a bunch of daily get-done lists planned out for the next week. So now, this is where you’re going to learn how to use your attention units properly. Everyone has more mental energy and willpower in the morning hours. This is a well known fact across most corporations in America. It’s why meetings are generally held in the morning hours (no one wants to attend a meeting at 4 p.m. in the afternoon). Human beings are generally more productive in the morning hours. It’s for this reason that you’ll want to knock our your most challenging, “scariest” tasks as early in the day as possible. By knocking out your challenging tasks early in the day, you’ll set yourself up for a smooth “downhill” ride during the rest of your day. This is a lot like going down a smooth slide. Once you climb the ladder, and make that big initial push downhill, everything else is going to feel effortless for you. Do the hard stuff first, and the rest of your tasks are going to feel easier and easier. As mentioned above, your best attention units are available in the morning hours, which makes the morning ideal for accomplishing big challenging tasks. Naturally, you’ll want to knock out easier tasks in the afternoon or evening hours. I usually save my least important tasks for the evening hours. In the evening time, I’ll usually take care of paperwork, bills, emails, text messages, phone calls, or anything that doesn’t involve intensive creative thinking. Of course, your evening hours are also perfect for spending time with family, socializing, and rewarding yourself after a fulfilling day of accomplishment. One of the recurring themes on ADHD Boss is to have a clear vision or mission for your life. This is because freeing up your attention units is easier when you understand why you’re doing it. In my case, I knew I needed to free up my attention units, because I wanted to commit myself fully to building more businesses and traveling more often. This is what “moves the needle” for me AKA excites me to wake up in the morning and get out of bed. Plus, you simply can’t build good businesses or enjoy travel when you have a hundred unfinished tasks and obligations lingering in the back of your mind. What’s your vision or mission for your life? How will freeing up your attention units help you achieve your life vision? But I do know freeing up your attention units will help you accomplish close to anything you want in life. Your future is entirely up to you and how well you manage your attention units. This concept changed my life forever, and it will have the same effect for you. People with ADHD don’t have less attention units than anyone else. Our brains are just wired differently. We require higher levels of stimulation, novelty and dopamine than the average human being. I like to travel internationally, change my environment, take intelligent risks, start businesses, and do all sorts of exciting things to live an incredible life with ADHD. When you have ADHD, you need high levels of stimulation to live a great life. You just have different needs. And it’s important that you live your life in accordance with your real needs. ADHD Boss is here to help you on your journey. Every single little step of the way.